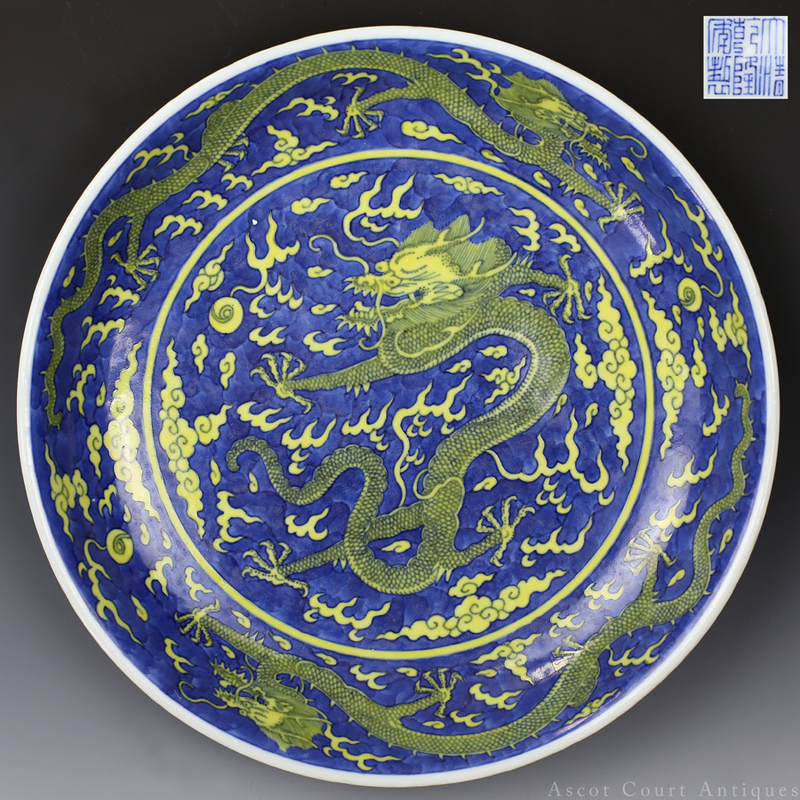 An imperial circular dish, Qianlong seal mark and of the period, reserve-painted with fierce writhing dragons pursuing flaming pearls amongst clouds, all against a ground of cobalt blue, and accented with overglaze antimony yellow enamel. 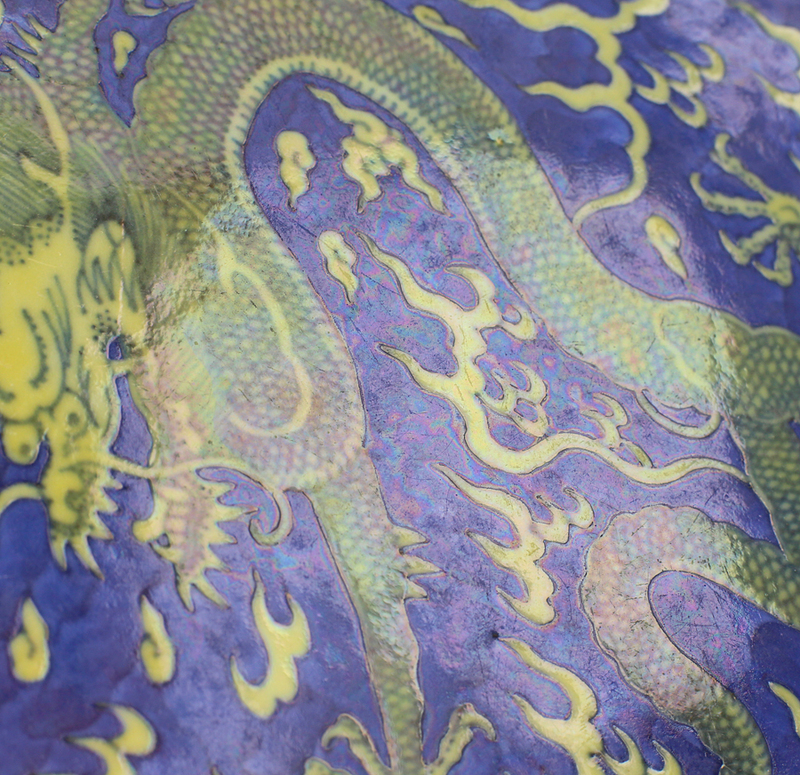 The reverse features two more dragons chasing flaming pearls, all above a petal lappet border. 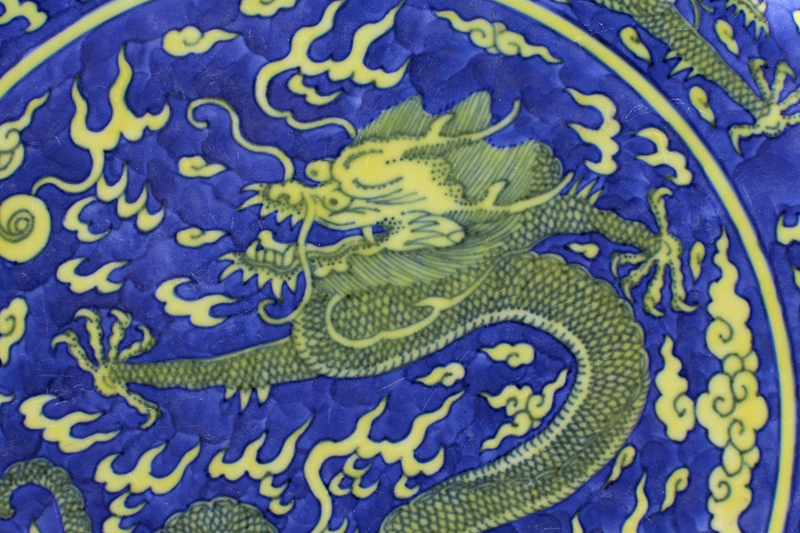 The dragons are five-clawed and bear the ‘demon-faced’ (guilian) countenance typically associated with early Qing renderings. 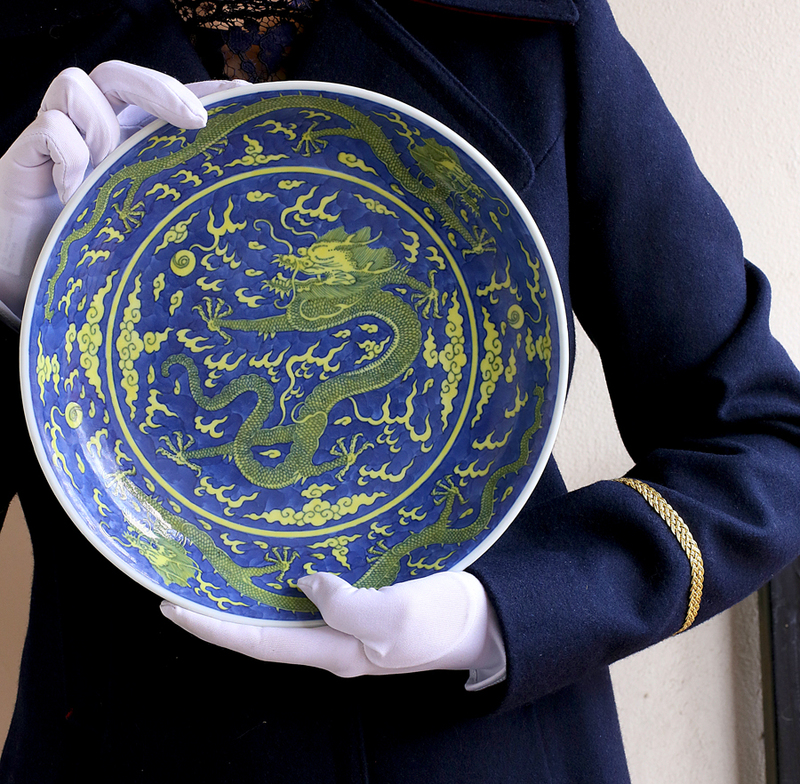 The superb quality of the cobalt blue and the exposed porcelain paste suggest this dish was made early in the Qianlong reign, circa 1730-40s. 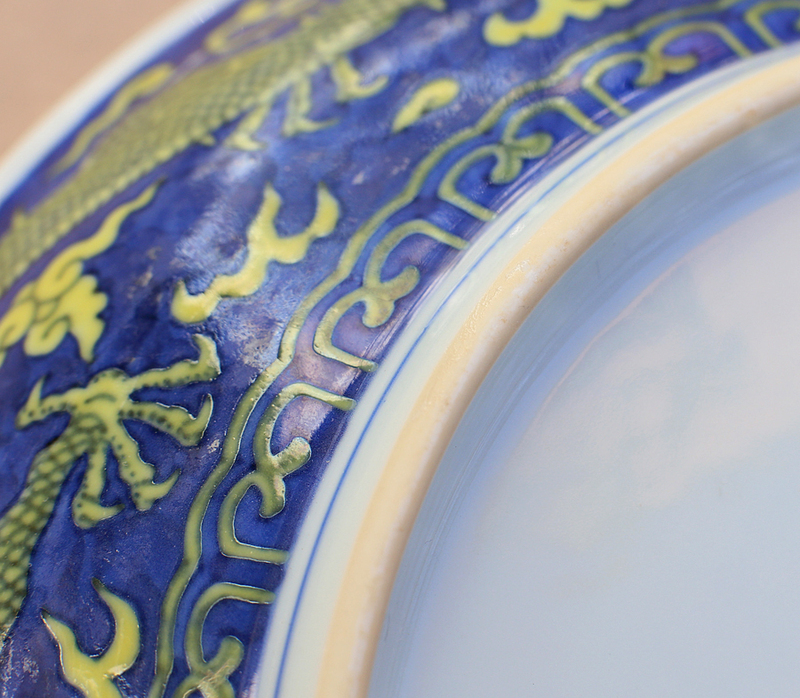 Transparent yellow enamel has been in use since the Tang dynasty. 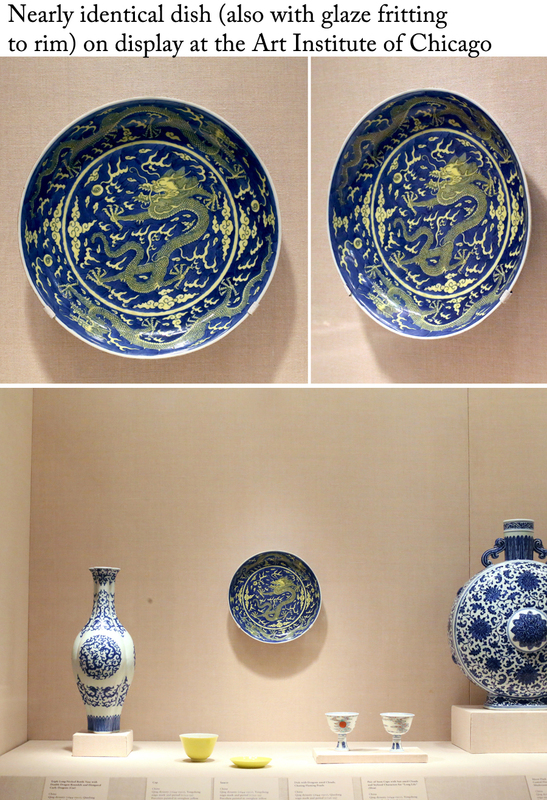 However, the paring of cobalt ground reserve-painted porcelain with overglaze yellow enamel was a technological innovation that appeared in the Ming Xuande period and enjoyed uninterrupted popularity in subsequent reigns. 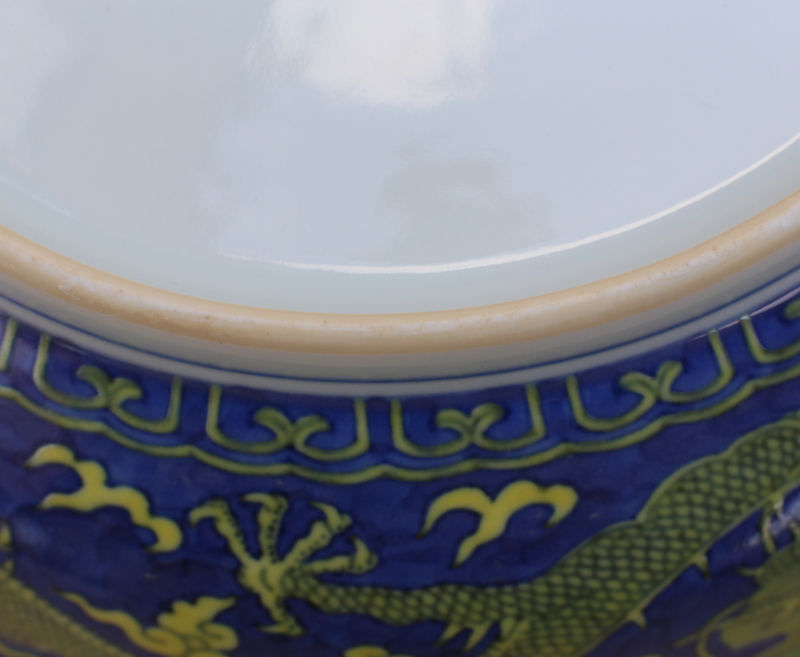 This decorative style is almost always reserved for porcelain made for the imperial court, as yellow was a color typically reserved for the Emperor and his household. 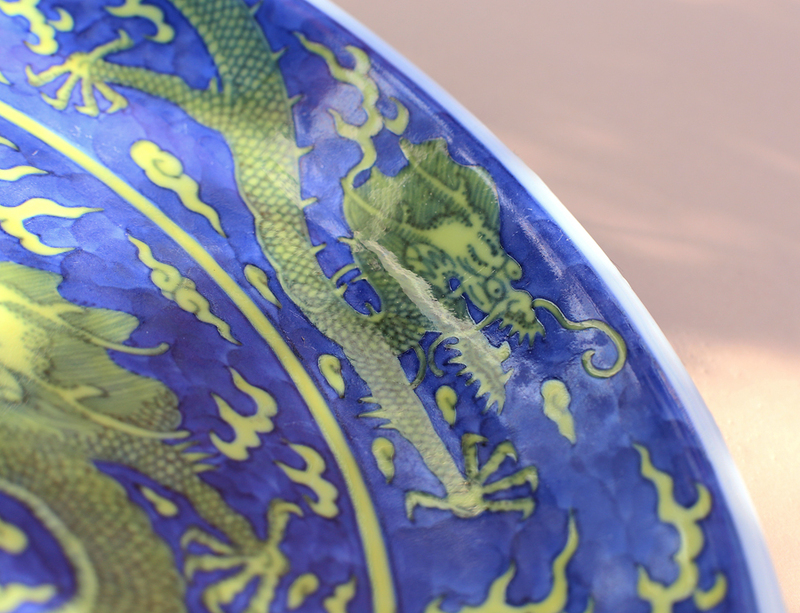 Please note that Qianlong dragon dishes of this type (especially those made early in the reign) frequently have fritted mourth rims that show the mushikui “moth eaten” effect, caused by glaze bursting and pulling away from the porcelain body while firing. 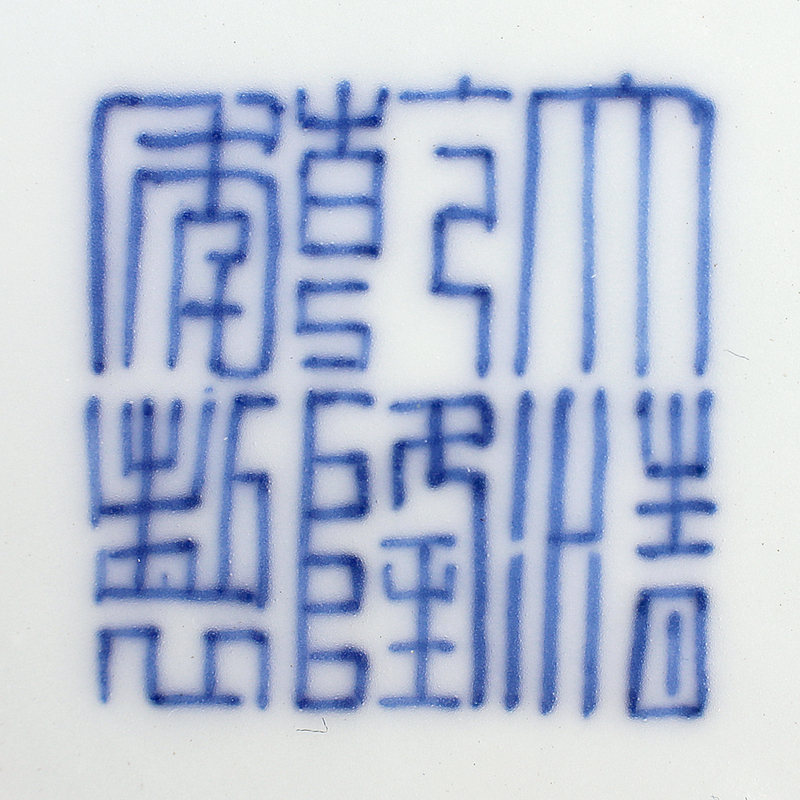 This characteristic is commonly associated with Jingdezhen porcelain made in the 17th and early 18th centuries. 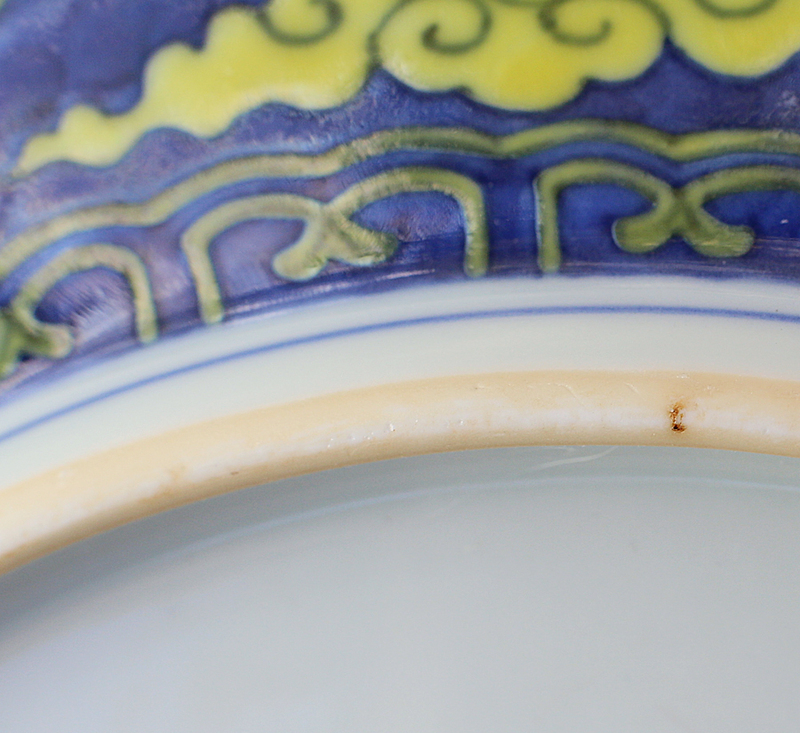 Several examples of this type of dish (including the one in the Chicago Institute of Art, as well as ones auctioned by Christies & Sotheby’s) have uneven rims or rims that have been entirely polished down due to glaze fritting. 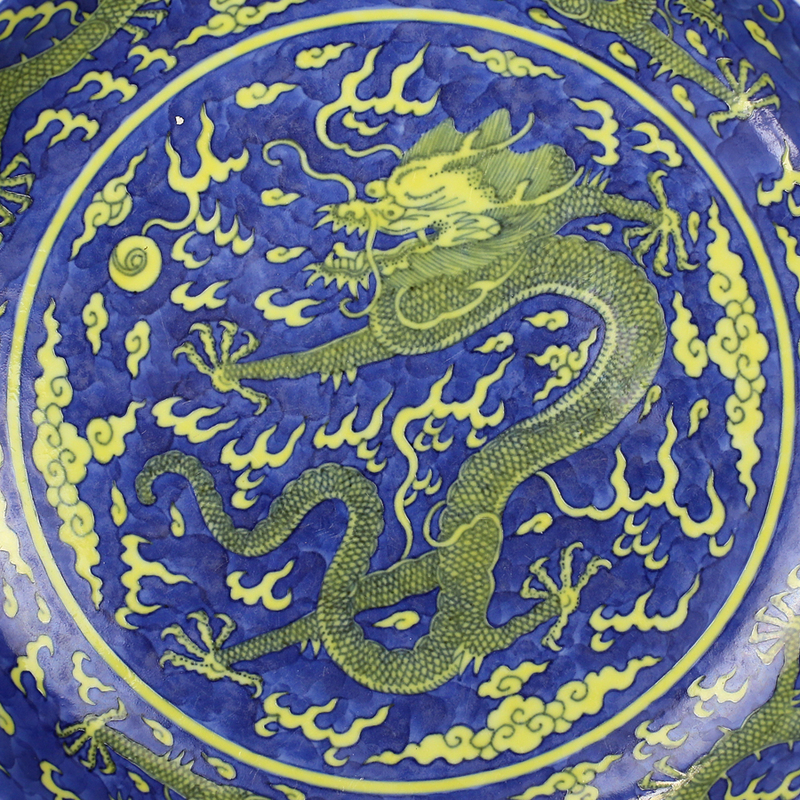 Qianlong dragon dish in the Art Institute of Chicago (Gift of Mr. and Mrs. Samuel M. Nickerson, 1900.1368). 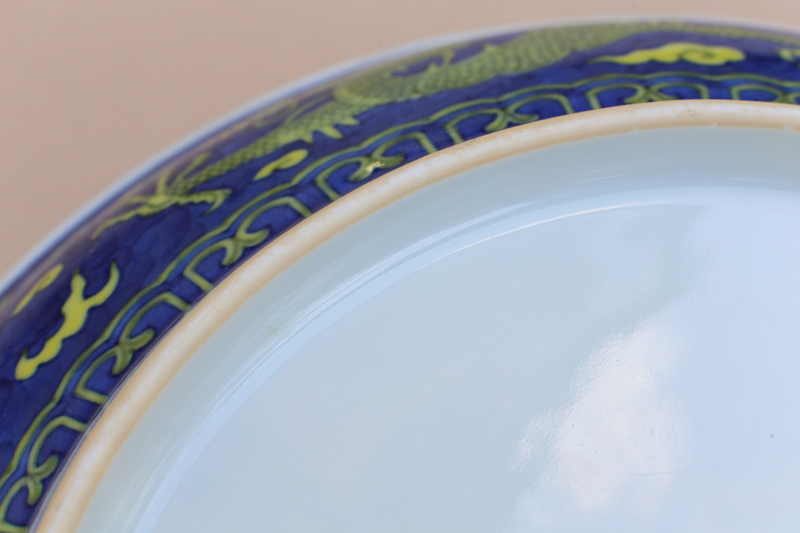 Note the ground down mouth rim due to issues with fritting. 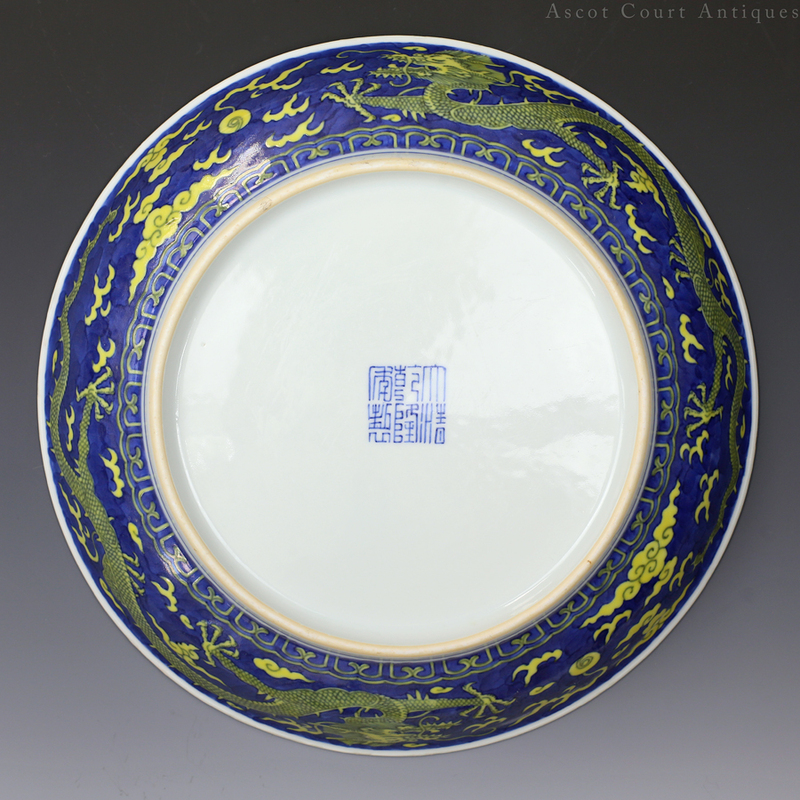 Lot 3142 from Sotheby’s 2011 Hong Kong spring auctions. 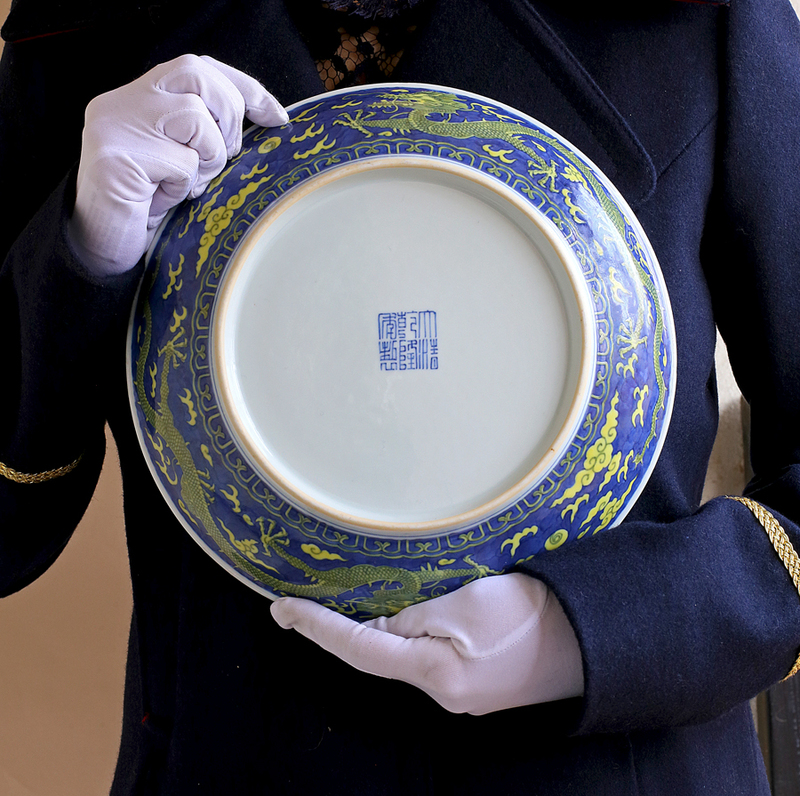 Lot 298 from Sotheby’s 2012 New York spring auctions. 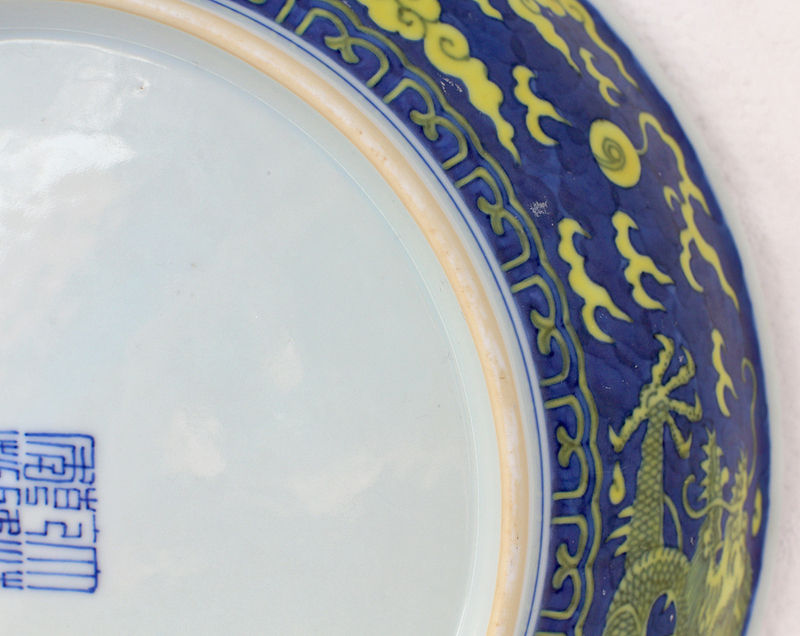 Lot 299 from Sotheby’s 2012 New York spring auctions. Lot 801 from Sotheby’s fall 2017 “Saturday at Sotheby’s” sale.